You will earn 4,107 Reward Points. Earn 1 reward point for every 1 dollar spent. 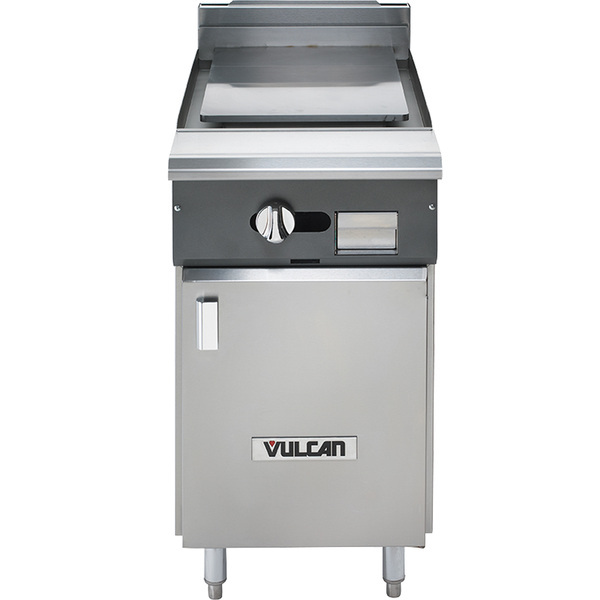 18" wide heavy duty gas range, Vulcan model No. V1P18 (modular) and V1P18B (cabinet base). Stainless steel front, front top ledge, burner box, sides, base, stub back and 4" adjustable legs. 1 1⁄4" diameter front gas manifold and 1 1⁄4" rear gas, capped. One 17,500 BTU/hr. burner with individual pilots and controls for each burner. 1⁄2" polished steel plate with 4" high side splashes. 1 1⁄4" rear gas connection. Total input 17,500 BTU/hr.